In the late 1950s, KPFA’s programmers discovered the ballad documentaries of Charles Parker. These came via the station’s subscription to the BBC Transcription Service, which supplied programs on LP to broadcasters around the world at a nominal cost. Two in particular of Parker’s programs caught their attention: Singing the Fishing, which told of the precarious lives of Britain’s fishermen, and The Big Hewer, which dealt similarly with the coal miners. Unusually for the time, the programs were assembled from actuality tapes of unscripted, unrehearsed interviews and they were tied together, not with the voice of an omniscient narrator, but with ballads specially composed and recorded by Peggy Seeger and Ewan McColl. One KPFA staff member whose imagination was particularly inspired was Ernest Lowe, who had trained as a photographer before joining KPFA. Intermittently over a couple of years he lived among the migrant farm workers of California, photographing them and recording their stories. These he put together into a remarkable collection of fine grained black-and-white photos and the instantly classic radio documentary, Sometimes You Work a Day. In our recorded conversation in 1993, he told me how he went about it. The broader story of the whole project [below] is from the website where many of the photos (such as the above) can be viewed. 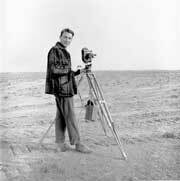 Ernest Lowe studied photography in the late 50's with the noted social documentarian, John Collier Jr., and his models were the classic images of Dorothea Lange, Walker Evans, and other Farm Security Administration photographers. These influences are reflected strongly in his work, which in some ways looks like a new page from the old FSA files. In 1959 Lowe joined the staff of Pacifica radio station KPFA and almost immediately began documenting the lives of migrant farm workers. "It was natural for me to combine interviewing for a radio documentary with photography," Lowe recalled. "I'd just walk up to people in a camp or an orchard and say, 'I hear you folks are getting a raw deal. I'd like to take your pictures and talk with you so people back in the city can do something about it." They very seldom turned him down. Many of these recorded interviews have survived. 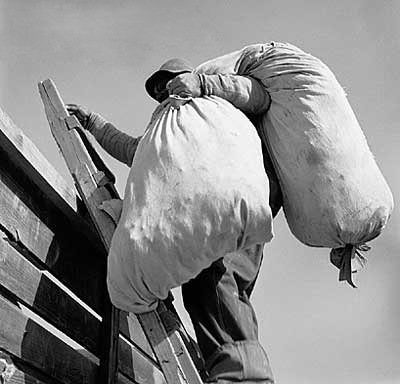 Working before conflict erupted, Lowe also enjoyed access to vineyards, migrant camps and the inner workings of agribusiness that later photographers were denied. These early pictures also reveal the multi-racial face of migrant labor. Blacks, Anglos, Japanese and Filipinos are pictured, as well as Latinos. At the end of the first year, Lowe showed his work to Dorothea Lange, who declared, "This is my family album," and loaned the photographer a 35mm Contax and a gift to cover film and expenses. In the fall of 1964, Lowe moved his family to the San Joaquin Valley and spent a year documenting the unincorporated African-American community of Teviston. Captured mostly in medium format, Lowe's images are carefully composed, quiet moments, seemingly frozen in time. Lowe's people can be monumental - icons of migrant life - but the images are also respectful, intensely personal portraits. This symbiotic relationship came full circle in 1972 when Parker produced The Iron Box: The Prison Life and Death of George Jackson. This was put together from recordings made by KPFA, and it is highly likely that much of the editing had already been done by Elsa Knight Thompson, whose narrative voice appears briefly within a few minutes of the opening. This gut-wrenching program gets no mention that I’ve been able to find in the Charles Parker archives; I have a copy only because I happened to catch it in its original BBC broadcast, in which it was clearly stated at the end that it had indeed been produced in its final format by Charles Parker. Would the person in Belfast who has accessed this page 77 times like to get in touch with me? I'm available HERE.